Tuesday afternoon, County Executive Ed Day hosted a meeting with the Executive Director of the Palisades Interstate Park Commission, members of law enforcement, emergency responders and state representatives to discuss the problems plaguing New York State Parks located within the county. 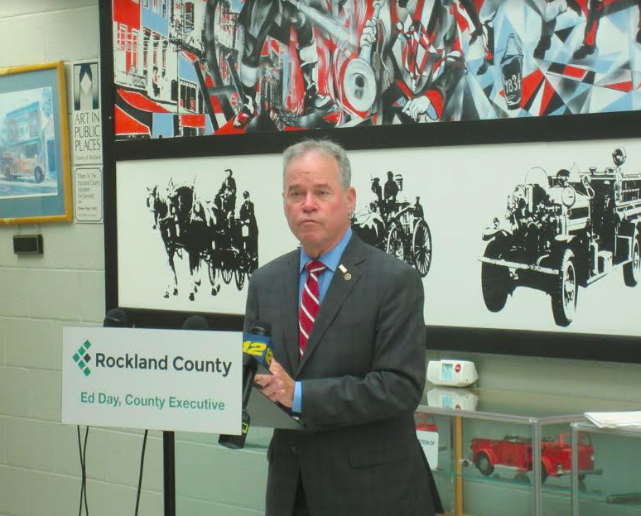 Executive Day met with more than 25 government officials at the Rockland County Fire Training Center to try and find a solution to the rampant overcrowding that occurred earlier this month at Rockland Lake and other nearby state parks. The meeting was called in response to the riotous Fourth of July festivities that took place at Rockland Lake earlier this month. Describing the situation as “mayhem,” Executive Day declared that conditions at the park were “unacceptable” and that “immediate action” is being taken to ensure that such a fiasco does not occur in the future. During Independence Day celebrations, Rockland Lake become so crowded that emergency services were unable to enter the park. Parking overflow left people setting up grills on the side of the road and leaving their cars parked in people’s front lawns while fights broke out in the Congers Road parking lot. Many revelers also broke the park’s strict no alcohol policy and were walking around openly intoxicated. Executive Day believes the key to preventing such pandemonium from occurring in the future is to better coordinate the efforts of law enforcement and health services prior to major holidays that attract such large numbers of visitors. The Rockland Fire Training Center is now scheduled to host pre-planning meetings in anticipation of Labor Day festivities, in order to make sure that “everyone is on the same page” and that local law enforcement is prepared to tackle any eventuality. Executive Day also cautioned that the county will be enforcing a “zero tolerance policy on law breaking,” promising to swiftly tow any car that parks in a restricted area and crack down on alcohol use within the park. Increased signage and social media alerts will be utilized to alert tourists and citizens when a park has reached capacity and direct them to alternate locations. Increased signage will also be used to clearly demarcate legal and illegal parking areas. Labor Day will be “a test run” of the new policies promised by Day while thanking the state officials for their help and cooperation in the matter. The County Executive concluded his remarks by expressing confidence that “the mother of all fourth of Julys” will not be repeated, and that the county is now better prepared and equipped to keep the parks safe and orderly.